Microsoft has just announced a new look and somewhat of a new direction for MSN, and a bit of a rebranding for some of its most popular apps. The new MSN, available now as a preview and rolling out over the next few weeks, features a fully responsive site, tighter integration with Microsoft services like Outlook.com, OneDrive, and Skype, top level integration with Facebook and Twitter, and a move to content curation with some 1000 partners on board. 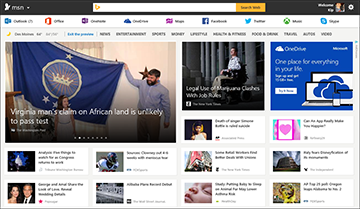 Microsoft will be longer be creating its own content for MSN, but will be rebranding the Bing apps (Food and Drink, Travel, Weather, and the like) over to MSN. If you remember all the way back to 2005, MSN was Microsoft’s major consumer brand. There was MSN Search, MSN Money, MSN Virtual Earth (an early 3D version of what became Bing Maps), and even MSN Soapbox, Microsoft’s failed attempt at a “YouTube killer”. Of course there were MSN Hotmail and MSN Messenger, too, and MSN in some parts of the world was nearly a verb. That all changed with the rebrand to Windows Live (well, it didn’t *all* change, as some services, along with the MSN.com website, stayed as MSN. Yes, it was confusing), and MSN Search became Live Search became Windows Live Search became Bing, and Steve Ballmer tried to trade MSN to Yahoo! in return for its search business, until Marissa Mayer pulled the plug on that. Anyway, now we’re back to square one again, and it’s not an entirely bad thing. The new MSN isn’t particularly innovative (it shares the same “infocard” look and the familiar image sliders popular on many modern websites), but it’s fully responsive, and Microsoft is hoping that you’ll want to share your services across your devices and MSN.com. Look up a recipe in Food and Drink or a stock in Money, and that information will follow you across not only all the devices you use, but on MSN.com, too. For the longest time, Microsoft has acted like it just doesn’t quite know what to do with MSN, especially under Steve Ballmer. New CEO Satya Nadella, who ran the Online Services business for a time, seems to at least be taking the bull by the horns and actually moving forward with MSN. Will this be the last rebrand for MSN and Microsoft’s online service? Probably not, we’ve seen all this before, but somehow this time it seems to all make a bit more sense. What do you think? Will you miss Bing-branded apps? Will you pay more attention to MSN.com? Or is this all too much déjà vu, all over again?